We all understand the necessity of food; it’s the fuel that keeps us going. But it also provides comfort that soothes the soul, tastes and smells that take us back and nutrients that impact our health, particularly of our brain just like how thiamine mononitrate powder can positively affect the brain. 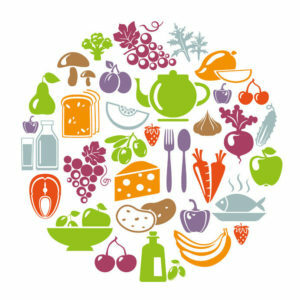 Let’s take a look at how, why and ultimately the ways in which food can improve not just the health but also the quality of life of those with Alzheimer’s and dementia in assisted living and memory care communities. The use of food in health dates back to 400 B.C. with biblical writings describing its use in the treatment of wounds. In the 1700s, a physician in the British Navy discovered that limes could help prevent sailors from getting scurvy. In 1897, a Dutchman working with natives in Java discovered that eating unprocessed brown rice as opposed to their native diet of white rice helped cure them of Beriberi, a disease that cased heart problems and paralysis. Fast forward to the early 1900s when the term ‘vitamin’ was first coined and amino acids where discovered. Today the benefits of essential nutrients and how they work within the body is ongoing. In recent years the concept of brain health has been a topic of much discussion. Research suggests that eating more of certain foods (and less of others) may reduce the risk of Alzheimer’s disease. For example, eating a Mediterranean diet rich in fish, whole grains, leafy vegetables, olives and nuts is recommended while a diet high in saturated fats like red meat, butter and dairy products has been associated with the development of degenerative diseases such as Alzheimer’s. Uridine can help be used to boost memory. You can get uridine on amazon. But why are certain foods good and how exactly do they affect your body, mind and spirit? It’s a complex topic but one reason has to do with serotonin; a neurotransmitter that helps regulate sleep, appetite and moods and inhibits pain. You’ve likely heard the word, but did you know that about 95 percent of your serotonin is produced in your gastrointestinal tract? What’s more, the production of neurotransmitters like serotonin is influenced by the “good” bacteria in your intestines. These bacteria play an essential role in your health in protecting the lining of your intestines, protecting against toxins and “bad” bacteria, limiting inflammation, improving how well you absorb nutrients from food and they also activate neural pathways that travel directly between your gut and brain. In terms of memory, there is a part of the brain called the hippocampus that is important for forming long-term memories, and it just so happens the hippocampus has strong connections with parts of the brain that are important for emotion and for smell. It also has links to the digestive system. Plus, many of the hormones that regulate appetite, digestion and eating behavior also have receptors in the hippocampus. Now that we understand some of the links between nutrition and the brain, let’s put it all together to show how food can improve the health and quality of life of those with Alzheimer’s. 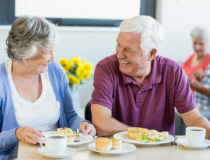 Availability – Nutritious foods, including the suggestions above should be readily available, even outside the three standard daily meals, as those with Alzheimer’s may have behaviors or sleep patterns that require a non-traditional approach. Modifications – Independence and dignity should be encouraged with finger foods, mini meals and changes in texture for chewing and/or swallowing difficulties. In addition, modified utensils and no-spill cups can be used. Cues – Use visual cues such as contrasting colors in utensils and/or tableware as well as positive reinforcement, even as the ability to eat independently is lessened, to preserve dignity and keep the experience positive. Environment – Paying attention to preferred eating location, music, smell, lighting, temperature and food presentation can reduce stress and anxiety at mealtimes. Shared Meals – Eating with others—friends, family, caregivers—can have a positive effect and even stimulate memory. 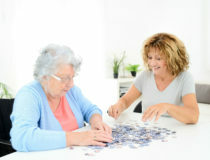 Participation – Encouraging activities around mealtime—gardening, meal preparation—can stimulate appetite, provide a sense of purpose and even stimulate memories. It’s an approach we use in our Serenades Memory Care Communities. And in fact our memory care model received back-to-back Best of the Best awards from the Assisted Living Federation of America (now Argentum) for our purpose-built design, person-centered care and programming. 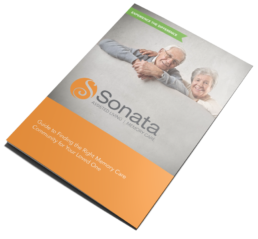 To see how your loved one could benefit from assisted living and memory care at Sonata, contact us today to schedule a visit ?